Hamburg have been fined £42,000 (55,000 euros) after a spectator hit Bayern Munich's Franck Ribery in the face with a scarf during a game in October. The midfielder made it 3-1 in the German Cup last-16 match on Wednesday, 29 October before a fan ran on to the pitch to confront him. Ribery said afterwards "fortunately, nothing much happened". 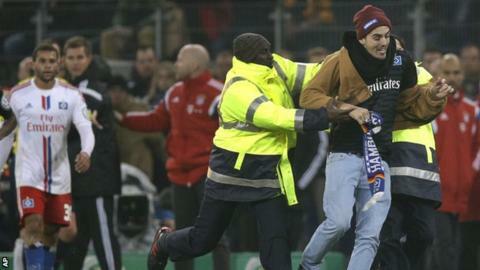 The German Football Association (DFB) said other incidents involving Hamburg fans were factors in the fine. "Against Mainz on 7 December, a whistle with an irritating sound was used several times from someone in the stands," a DFB statement added.